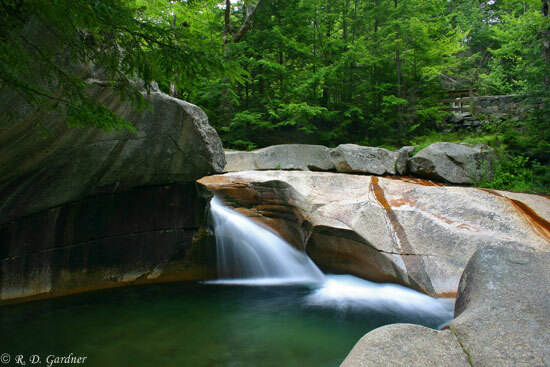 This "waterfall" (loosely defined in this instance) can be found in Franconia Notch State Park. The state park is located in the White Mountain National Forest and runs for about eight miles along I-93 from Flume Gorge at the southern end to Echo Lake on the northern end. The parking area is accessible from both the northbound and southbound directions. There are picnic tables in the area as well. As a bonus, the trail for Cascade Brook Falls and Kinsman Falls starts here. There are several other good waterfalls within Franconia Notch State Park, including Avalanche Falls, Liberty Gorge Cascade, and The Pool (within the Flume Gorge area), and Cloudland Falls to name a few. Personally I wouldn't come here for The Basin but for Kinsman Falls. Alas, time constraints and a "tired" wife kept me from visiting the much better Kinsman Falls. Franconia Notch State Park is hard to miss. Your best bet is to visit the Franconia Notch State Park website for directions. This is not a hike per se but a short walk from the car. A polarizer is essential here for reducing the glare off of the granite rocks and the water. The water is crystal clear and a beautiful color so you certainly want to capture as much of the true color as possible. For the slow shutter speed effect a tripod will be required as usual. I would recommend a wide angle zoom lens as the best viewing is nearby. An alternate shot of The Basin could be taken downstream from the rocks if you don't mind crossing the fence. There aren't any real dangers here except for slipping and bruising your, ummm, "pride". By Randy Gardner, All content Copyright© 2006-2016, All rights reserved.